The following map represents the 'Proto-Greek' homeland, ie where the earliest form of Greek speech was located, thus where the earliest Greek peoples were located. Indo-European linguist V. I. Georgiev. "The Proto-Greek region included Epirus, approximately up to Αυλών in the north including Paravaia, Tymphaia, Athamania, Dolopia, Amphilochia, and Acarnania), west and north Thessaly (Hestiaiotis,, Perrhaibia, Tripolis, and Pieria), i.e. more or less the territory of contemporary northwestern Greece)"
SOURCE : Georgiev, Vladimir Ivanov (1981). Introduction to the history of the Indo-European languages. Pub. House of the Bulgarian Academy of Sciences. pp. 156. 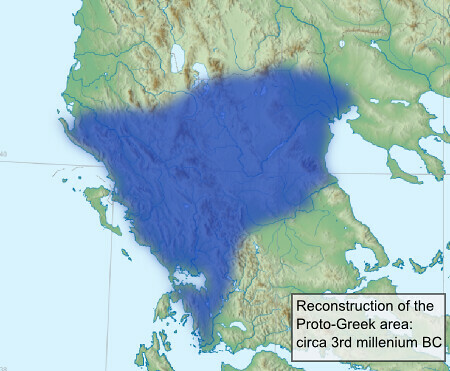 Proto-Greek was probably spoken in North/Northwestern Greece at latest in the late 3rd millennium BC. Why? Because Mycenaean Greek which is documented to be have been spoken at around 1600 BC is already fully recognizable Greek, so it must have been Greek for quite a while before. Not to mention Mycenaean Greek was also dialectal Greek, so its divergence from Proto-Greek must be pushed into the past, certainly in the 3rd millennium BC at the latest. It should be noted that this linguistic timescale and Proto-Greek homeland map is going by the still somewhat speculative Kurgan hypothesis for the breakdown of Indo-European.